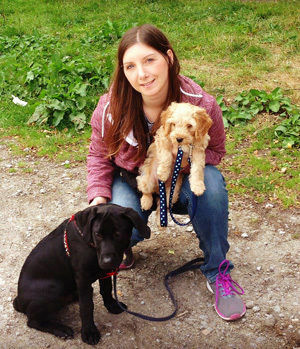 Looking for a local dog walker or pet sitter in Harrogate? Look no further! Established in 2016, Jurassic Bark offers a reliable, affordable and professional dog walking and pet sitting service in Harrogate, North Yorkshire. I do all the walking and visits myself, so when you meet me at our initial consultation you will know exactly who will be looking after your pet. We currently take bookings for dog walking, cat sitting, puppy, senior and small animal visits. Jurassic Bark Harrogate is fully insured, DBS (CRB) checked, trained in Canine First Aid and subscribed to the Harrogate Borough Council’s Professional Dog Walkers Code of Conduct. I have also completed a Diploma in Canine Behaviour with the ISCP, qualifying me as a Canine Behaviour Practitioner along with several other relevant courses. Whilst you don't necessarily need canine qualifications to be a great dog walker, my studies into canine behaviour - especially canine body language - have been invaluable and enabled me to spot immediately when something isn't quite right. As a result, all of our walking groups consist of sociable dogs who love their walks. I am also an associate of the International Companion Animal Network (ICAN), an organisation whose ethos includes using reward-based methods when working with animals, so you can rest assured that I'm always being kind to your pooch. You can even check what your pets are up to via our Facebook page! Head over to our services pages for more information or contact us to discuss your specific requirements.